Luhansk, April 2014. The sign near the regional SBU headquarters reads: 'Don't believe the mass media. Come and see for yourselves. 'Over the past 15 to 20 years, progress in information technology has come to play a cruel joke on journalism. The ability to instantly report on events happening at the furthest corners of the globe has brought maximum efficiency to the profession, breaking down borders and making the world ‘smaller’. As practice shows, this approach does not necessarily preclude editors' commitment to objectivity or accuracy, or to presenting a balanced point of view—though this is largely a matter of editors' professionalism. Nevertheless, it’s difficult to imagine Libération welcoming a raise in the retirement age, the Financial Times – outrage at tax cuts for business, or even Vice News opposing the legalisation of marijuana. In over 20 years of independence, Ukraine’s domestic media has never become a space for this sort of discussion. The reason? The near complete absence of active discussion in the media, as well as the inability of most Ukrainian citizens to identify the key questions facing society and to split into—at the very least—left- or right-wing, conservative or liberal, supporters of mono- or of multiculturalism. Rather than determining their position on the geopolitical options, the revolution of February 2014, the annexation of Crimea or the war in the Donbas, the majority of Ukrainian media took sides on these questions depending on the interests of their owners. Rather than drawing a line in domestic politics between democrats and authoritarians, believers in the free market and statists, pacifists and militants, clerics and secularists, journalists simply divided readers into supporters and opponents of European integration—pro-Maidan and anti-Maidan, vatniki (citizens of the south-east deemed to be pro-Russian) and vyshivatniki (citizens of ‘patriotic’, anti-Russian views), patriots and separatists. ‘I don’t understand. Is this #betrayal or #victory? Help me figure it out.’ This ironic comment on social media has rapidly become Ukrainian society's latest demand when it comes to the media. And as the press loses public confidence, it is left with no choice but to apply this simple dichotomy to everything happening in Ukraine. This article first appeared on Ostpol.de in translation by Dinah Zeldin. We are grateful for Ostpol's permission to repost this article here. 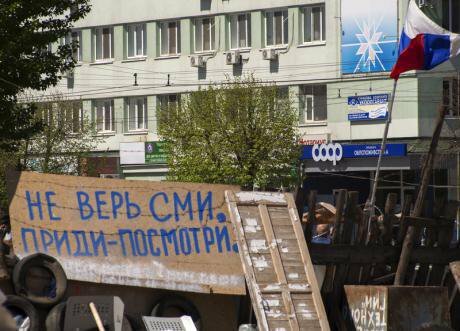 Standfirst image: Sign near regional SBU headquarters in Luhansk, April 2014. (c) Igor Golovnoiv / Demotix.